South Carolina's Jadeveon Clowney could be the No. 1 overall pick in this spring NFL draft, with the Houston Texans currently holding the selection. 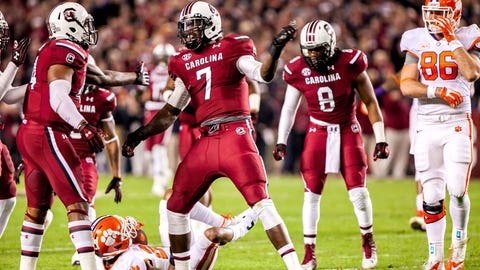 Following his team’s 34-24 victory over Wisconsin in the Capital One Bowl, South Carolina’s Jadeveon Clowney confirmed his intentions to declare for this spring’s NFL draft. On Wednesday, the junior defensive end, a preseason favorite for the Heisman Trophy, offered a low-key declaration of turning pro on the ABC broadcast, providing two "Yes, sirs" to Tom Luginbill, after the sideline reporter/recruiting expert asked if this was his final college game … and would he make an immediate jump to the NFL? The Houston Texans own the No. 1 overall pick in the 2014 draft, with the St. Louis Rams holding the second selection (via the Washington Redskins). It’s possible that Clowney (6-foot-6, 274 pounds), a once-in-a-generation talent among pass rushers, could end up with either club — regardless of the quarterback-prospect market.